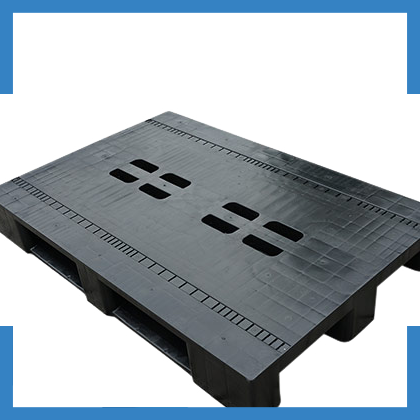 The VIP-series plastic recycled pallets, where VIP stands for Very Intelligent Pallet, is perhaps the best plastic pallet available in the market. The plastic pallets are available in Euro (800x1200mm) and Industry size (1000×1200 mm). In addition to a standard open upper deck, this plastic pallet is also available with a closed deck. The ergonomic handles in the middle of the upper deck are standard, making lifting the pallet very simple and less heavy. The VIP series has extra thickened walls that can withstand bumps, as well as bigger impacts. On top of that there are plenty of options. The recycled VIP pallets comes standard in black. Both the 800 and 1.000 series in this color are permanent available. Although the VIP Pallet is very strong and durable without the runners closed, in some situations closed runners are required. This often is the case within the food industry. The material we use to close our runners, is the best available in the market and therefore durable and very long lasting. To prevent the VIP pallet can shove from the forks of a forklift, we advise to use our VIP pallet anti-slip blocks. These anti-slip blocks are manually fixed. Very simple, very reliable. To enable our customers to use the VIP Pallet in automatic racks, we followed the sizes of the EPAL pallets. For the production of our recycled pallets we use a so called hybrid material. This is a combination of 60% recycled raw material combined with 40% virgin plastic. This makes our recycle pallets one of the strongest available. To facilitate easy manual lifting, we created ergonomic hand holes in the centre of the pallet. Since we only use the very best raw materials available in the market, the VIP Pallets can be used in both low and high temperature surroundings. We also use UV protectors in our materials, delaying the aging proces of the plastic. To use the VIP Pallets in drive in – drive out racks, we can reinforce the VIP Pallet with 2 stainless steel profiles. This is the ultimate and safest way to use the VIP Pallets in racks. To make identification of your VIP Pallet more easy, you can choose to print a name and/or logo on the blocks. We use 4 different colors, black/blue/red/yellow, from which you can choose. High performance in statistic and dynamic loads. To make identification of your VIP Pallet more easy, we can put a name and/or a logo at the blocks (see picture). The VIP pallets contain 4 hand holes in the centre of the top deck. This facilitates easy and ergonomic manual lifting of the pallet. In some situation however the top deck has to be completely closed. For this goal we supply special parts to close the hand holes and create a full closed deck. We can deliver the VIP pallet with and without boards on the top deck. Boards are normally used to prevent crates and boxes sliding of the deck. The boards are applicable with both VIP open deck as well as with our closed deck pallets. To prevent goods can slide off the deck, we advise the use of anti-slip blocks here as well. Manually fixed, assuring you maximal grip of your goods.To enable our customers to use the VIP Pallet in automatic racks, we followed the sizes of the EPAL pallets.